I wrote this piece on a return visit to Saigon in 2010, and then had it languish for several years in the queues of a few literary journals. (My youthful aspiration was to be published by a venue that had hosted David Malouf, but that was not to be.) So here is the self-indulgent, unbowdlerized version after all these years, and with photos; somewhat amazingly my Picassa xe ba bánh gallery persists, and less surprisingly my web tech does not. Doubtlessly much else has changed in the intervening time, and I apologize for being so late to the party. — Peter Gammie, Chicago, July 2014. Voi Úc feeds female Asian Elephant. July, 2007. Sweat pools around my collar, coming from places I didn't know had pores. The man behind the shabby table with the obsolete computer gestures at the visa in my passport with increasing agitation. I begin to understand that this is not going to be routine, that the armed men on their national service might be asked for more than a tough pose. I try to act normal. I follow his finger, which has come to rest on the date from which my visa is valid: it is tomorrow. I make what-now gestures, vaguely remembering the general advice to smile. After an increasingly suggestive pause he shrugs, and with exaggerated care stamps my passport and waves me through. Thus for four hours I am an officially sanctioned illegal alien in Ho Chi Minh City. A week later em Huy brings me to Disability Resource and Development (DRD), my mother organisation for the coming year, on the back of her motorbike. I grasp her waist with trepidation as she breezes through peak-hour traffic, already knowing that the helmet that marks me out as a foreigner isn't going to save me. DRD occupies a large cinderblock edifice surplus to the Open University's requirements in a decent location on the fringes of District 1. The office itself has a lino floor, the standard office machinery, air conditioning and erratic electricity which periodically gives us the afternoon off. The door is locked with a hefty bicycle chain and padlock, additional to an omnipresent guard at the gate. I soon discover that the gents' is not intended for use, and playing the foreigner wildcard I brazenly use the women's. One day a truck passes with The Godfather theme as its horn tune, and I imagine Uncle Ho smiling quietly to himself. The cramped conditions, general discomfort and absence of the boss makes it both necessary and easy to bond with my coworkers. Chị Hạnh has traded chemical engineering for a calling closer to her heart: advocacy for people with hearing impairments. Em Cử, whose name taught me to be careful with the squiggles, is the employment officer, tasked with linking employees with employers, and making their workplaces accessible. Em Loan is the Assistant Director, stopping up all the gaps. Almost as organisational policy, everyone at DRD has a disability; some ailments were unfamiliar to me, as polio and the like were conquered long ago in the Western world. Mine are short-sightedness, being the first volunteer at DRD, not knowing Vietnamese and lacking a wife. I soon learn DRD is matriarchal, and that capturing the requirements for their new website lay beyond my capabilities; here successful discourse requires patience, deference, concrete artefacts and a thick hide. My counterpart, DRD's IT minder em Huy, lacks the technical training to help in this process, and is not disposed to learning it. I decide to satisfy some Platonic ideals, to chase standards-compliance, universal accessibility and software engineering instead of other banalities I cannot measure. My typical day consists of finding Trung Nguyên cafes and elaborating details of theories barely of interest even to other computer scientists. I also visit several disability-related projects around the city; on her tiny but powerful Yamaha Mio, em Loan takes me to Handicap International's spinal injury rehabilitation project, which operates out of a hospital in District 8 that is the closest thing I see to the cliché of a tropical idyll. Em Loan once was a peer counsellor here, mostly providing guidance for young men after their motorbike and industrial accidents. I meet Eric, an affable Belgian, and he explains carefully how things will go, how the finance will be perpetuated. I am reassured that there are such experts in Vietnam. There is always talk of fixing this, e.g. this article from Vietnam News for 2010-05-27. My experience is that customers collaborate with business owners in dodging police crackdowns by scrambling to move offending objects. Also the State is attempting to impose fines on pedestrians for traffic violations (Vietnam News, Than Nhien News), which is patently absurd. The difficulty a foreigner has in comprehending the State is exhibited in this triumphalist article: Traffic violations plunge 40% as police get serious (Vietnam News, 2010-05-22). The real question is whether behaviour will change in the long term. Initially I decide to walk the streets, for vaguely environmental reasons: to get some exercise, to immerse myself in the city, to avoid contributing to the smog and congestion. I learn to cross the road. Against all advice to walk slowly, one can walk as quickly as one likes, provided one is predictable, allowing drivers to react, or not, as the case may be. It is not fun though: the footpaths are full of stalls, tables and parked vehicles, and the agents of vice are certain that all Westerners are always looking for hookers and blow. The zebra crossings are sick fictions, the little green man a fabulist, and the turn-right-against-the-lights rule means that crossing at corners is always perilous. Here traffic consists mainly of motorbikes, and fluidity dominates; otherwise wheelchair-accessible public spaces are fenced off to prevent them being overrun by those who believe that the shortest path between any two points is a straight line. After a month of bargaining with every shyster xe ôm (motorbike taxi) in District 1, I decide to rent a vanilla 100cc Honda Wave α. Training involves a few laps around the undercover motorbike park at DRD and some advice: keep my feet on the pegs, use the foot brake and not the front-wheel hand brake, start in second gear, get up to top as quickly as possible. Then we're off down Trần Hưng Đạo to the busy roundabout out front of the Bến Thành tourist market. Em Dũng, fearlessly enthusiastic in his role as instructor, roughly doubles the weight on the bike, making the accelerator spongy, the steering and balance more challenging; I feel guiltier about imposing my bulk on the people who had been driving me around. Upon returning to DRD I am told in translation not to look over my shoulder, to forget about those behind me and just go for it. In contrast to the rigid individualism that pervades the roads of Australia, Vietnamese traffic is an exercise in almost mandatory cooperation. The vast majority of people, while perhaps seeming pushy, slot gaps in an approximately fair manner, greedily micro-optimising the peloton. This is efficient only in quite limited circumstances, a fact known to every computer scientist, and I find this lack of perspective both cute and irritating. Size brings right of way, but there is little malice in it — the taxi driver knows his haste is not worth someone's life. I learn that my safety margin is someone else's slip lane, but with enough friends one can drive anywhere on the road. Turning left requires guts and mates, a building of critical mass until we fission from the boring mainstreamers and overwhelm those coming the other way. Launching from the lights is like catching a breaking wave: one is either in front, riding it, or underneath struggling for breath. Sometimes being on a motorbike in a Vietnamese city is exhilarating, a thing of strange grace and beauty, but more often it is a mystifying encounter with the values of a rapidly changing society; the citizenry appears to be in an incoherent hurry to get somewhere, anywhere, at almost any cost. The destiny of the country may well be contained in its traffic, a Faustian bargain with terrible health and safety standards. The Chaly and I on that bridge. A few weeks later I really learn how to ride down at Bạc Liêu, in the heart of the Mekong Delta, on a 50cc Honda Chaly that my future mate Darren had pimped. We go on a huge tour, approximately thirty Westerners, containing the largest cohort of Australian volunteers and hangers-on that town is ever likely to see. The Chaly is difficult to start, and it prefers stalling to idling after going through some humongous puddles. It is confiscated by some local mechanics who clean and then decide to replace the spark plug; they teach me that trust is not discretionary here, it is assumed and only sometimes terminated after violation. Darren finds out about this via some bizarre surveillance network that extends all the way back to the city, and backtracks to sort it out. Later I am nearly swallowed by one of the nine dragons when I barely make a turn after cresting a narrow bridge. My helmet rubs a zebibah of devotion into my forehead and I do wear it often. We drink in the evenings and everything becomes much simpler. The project was partially funded by AusAID and implemented by GHD. Darren worked on the Bạc Liêu part of a hefty project that brought clean water, sanitation and drainage to three towns on the Delta. This new prince of the town is famous for burning money, albeit less literally than the previous one. When we visited the treatment works I quizzed him about sustainability, and was told that each household would have an individual meter, which struck me as ridiculous, for the Vietnamese are genius mechanics: I imagine most are bypassed by now, and that those charged with their reading are getting more from kickbacks than salary. Darren and friends on the Chaly, later that night. Back in Ho Chi Minh City I come off the bike a few more times. I run into a pedestrian out the back of Bến Thành market, inflicting a mild bruise on his upper arm with the handlebar. Eyeing me mildly, he picks me up, then the bike, and hands it to me before continuing on his way. Apart from embarrassment, the worst part is not some loss of skin but the bruising of the inner thigh by the seat as the bike goes horizontal. I drive a lot more cautiously after drinking, and perhaps for that reason never had an accident where alcohol was a factor. The weeks drift by, and Ho Chi Minh City becomes Thành phố Hồ Chí Minh, and soon Sài Gòn; amongst the young the name has never been political. My driving improves, I begin daydreaming in the traffic, alloting just the minimal attention demanded by the other vehicles. I learn that tiêng việt without digraphs, diacritics, tones and familial pronouns is like phở without chilli. Disability and disadvantage are highly public in Việt Nam, and early on I decide that the people will get my labour but not my money; being inept at public relations, I end up looking hard. However I find the Vietnamese to generally have a great sense of humour, and perhaps because it is harsh, with childish glee taken in winning, I am reminded of the old, defunct Australia, of Lawson and the bush, where keeping things light made adversity bearable, partly by averting arguments about the point of it all. There are also the parallel fixations of gambling, drinking and smoking amongst the men, with the women splitting into the wowserish and the transgressive, underpinned by a univeral pragmatic tolerance and love of song. I wonder how intentional is the irony of naming the main road between downtown Vietnamese Sài Gòn and Chinese Chợ Lơn after the mighty general Trần Hưng Đạo. Mind you, the Eurostar terminates at Waterloo. I begin talking to em Bích, a volunteer at Sozo and DRD, who I come to realise is something of a counter-culture firebrand, having helped organise a huge art installation and party on a junk at her uncle's place soon after I arrived. She rides a Yamaha Mio with trainer wheels, colloquially a xe ba bánh even though it has four wheels. On it she can keep up with everyone, but with me on the back she restricts herself to a still scary 25kph on fat Lý Thái Tổ boulevard. My curiosity is piqued by the freedom this vehicle has brought her. I delve. I ask everyone's assistant, the generalist em Loan, to explain. Em Loan is a woman of roughly my age, second in seniority at DRD, and very engaged with the local disability community. Like em Bích, a childhood bout of polio has left her with a slow gait; I doubt a Western system would consider her seriously disabled, though I would expect the transportation authorities to extend her some consideration. She was the president at the Disabled Youth Association (DYA) for a term of two years, and over several coffees she sketches for me her involvement with traffic issues affecting her constituents, and the uncertain status of xe ba bánh. Em Loan begins with her engagement with Handicap International's road safety project in 2006, which they developed in tandem with the local transportation department. Funded by Handicap International, DYA organised some road regulation training sessions for about a hundred people with disabilities (PWDs). Why make this specific to PWDs, I ask naively, thinking that all drivers in the country could benefit from serious edification. Em Loan asserts that the average education level of PWDs is much lower than that of the general population. This is largely due to societal attitudes towards disability; for instance, until recently the State held that a sign language could not possibly communicate complex concepts, and so people with severe hearing impairments generally spent only five years at schools that shunned their main mode of expression. Moreover it is shameful to bear a child with a disability, and such offspring are considered an economic burden by the family. Some children are hidden at home and not allowed to attend school, a violation of the State's requirements; rumours circulate that this is a practice common among highly-ranked officials. Some disabilities may preclude people from participating in many of life's signal moments, not the least being riding a bicycle in traffic and getting married. The bedrock of these attitudes is a combination of Buddhism and Confucianism, which have an immanence that shames the vestigial Christianity of the West; here the traffic makes some sense as a koan about forgiveness, whereas back home it is entirely banal. It is obvious why Westerners seek spiritual solace in countries such as these, which have a wholism that is yet to yield to the reductionist knife. However to these tone deaf ears the Zen philosophy has elements that sound zero-sum and somewhat illogical: every action having a reaction does not imply that every result has a cause, and there is little reason to believe that the dogma of the market, that there can be two winners in a trading pair, is necessarily wrong. Clearly many abstract ideas violate the law of nature, with compassion being vaunted as one of the most human. The accompanying highly unnatural metaphysics merely increases the allure to the children of the Western Enlightenment seeking the Eastern, and vexes the natural born not at all. Confucian filial duty manifests in the ancestral shrines, populated with Buddhas, and the social convention that all elders are wise. A person's disability is taken by some as indicating a travestied earlier incarnation; the burden the person imposes on others has corresponding antecedents, such as a need to develop empathy. However a naively optimistic Hồ Chí Minh asserted, with wilful obliviousness, that "all men are created equal" back in 1945, so clearly these sentiments are not the entire story, and indeed the State has many statutes that are sympathetic to PWDs. 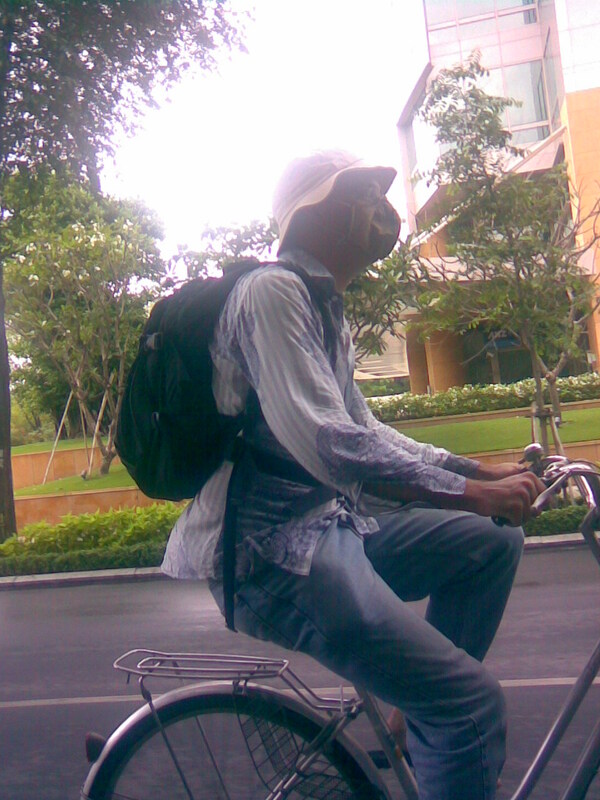 Wearing a helmet became compulsory on December 15, 2007. Before that it was rare to see one on anyone but a foreigner within the city limits, apart from the women, vampires according to local legend, who wore the arm socks, face masks and hats of the midday purdah to ward off the sun. The State was successful with this particular mandate apparently due to simple arithmetic: the fine was equivalent to the cost of a new helmet. Most troubling to me is the thought that those who rode and continue to ride bare-headed or paralytically drunk simply do not know the magnitude of the risks they run, that a head or spinal injury is likely to be permanently debilitating, a risk exacerbated by the general ignorance of first-aid, and a lack of follow-up care, the occupational therapy and social re-integration that a Westerner would expect. Here the hospitals focus on medical treatment and physical therapy, and that is the end of things. I began to understand the enormous contribution that the road safety project of Handicap International would make. Japan's International Cooperation Agency (JICA) ran a complementary project at the Chợ Rẫy hospital for people who had lost some body function due to brain injury, trauma or stroke, and I was fortunate to join the indomitable Yumiko-san and her group for an enjoyable afternoon of games, song and chatter at Đầm Sen Cultural Park. We took the public bus, on which PWDs registered with the local Department of Invalids and Social Welfare can travel for free. Unfortunately these are generally not accessible, and the bus drivers are under such financial pressure to meet the timetable that they often only slow down at signposted zones, rarely coming to a complete halt, so passengers must scramble. This behaviour seems even more pointless when the bus gets stuck in a traffic jam barely fifty metres up the road. Again, micro-optimised super-efficiency is the enemy of the adequate. Despite their knowledge, the staff of DRD did not wear helmets before they were compulsory. I am dumbfounded when em Loan tells me that so many people with minor mobility impairments do not have driving licences. The State provides many reasons for denying her one: her "percentage disability" as calculated by the local Department of Medical Assessment is too high, she is too short, and more recently they think her chest is too small. (This last proposal provoked one wag to suggest that the traffic cops were envious of those working in vice, and another that padded bras would become bestsellers, as if they are not already.) It seems common for a person to be assessed as too disabled to get a licence, and too functional to qualify for a pension. Thus most people who come to DRD have no formal aquaintance with the traffic rules. The DYA / Handicap International sessions did raise awareness in several quarters, and while the road safety department agreed that training PWDs is a good idea, they baulked at issuing full licences. Each PWD instead received a card of tentative validity: good for T.P. Hồ Chí Minh only, it does not allow the bearer to buy or sell a motorbike and it remains unclear if it is acceptable to the police. Perversely, people who have acquired a disability retain their licences, as these are for life. Em Loan and I met cô Xuyến, the manager of the Kiến Tường xe ba bánh workshop, in May 2010. Cô Xuyến showed us many photographs of the xe ba bánh her workshop has constructed, including one for use by a man who had lost the use of his right arm. Like em Bích, many DYA members in attendence drive self-modified xe ba bánh, three- or four-wheeled motorbikes, and having detected a willingness from the authorities to parlay, they express interest in getting these registered. The variation amongst drivers and their vehicles is huge; at the top end of bikes is the type ridden by em Bích: a new 100cc Yamaha Mio or 125cc Nouvo with a pair of well-engineered undriven trainer wheels. These bikes have automatic transmissions and hand brakes as standard, with room on the back for a wheelchair or passenger. Performance is impressive, as an Australian wheelchair user demonstrated to me one soggy afternoon by doing wheelies around a carpark. He is entirely autonomous, getting between the chair and the bike without assistance, and is adamant that his mobility in Vietnam is superior to that in other Asian countries; I wonder if it is this good in Australia. Such a xe ba bánh costs a total of about about twenty one million Vietnamese Đồng (VND), roughly $AU1,200. Chị Hiếu, a wheelchair user who joined DRD in March 2008, drives what might be the quintessential xe ba bánh. Hers started life as a standard low-end motorbike illegally imported from Cambodia, which was then modified by one of the two specialist companies in Sài Gòn. Generally the rear wheel is replaced by a pair, with only one being driven. If necessary, hooks are added so that the rider can store their crutches along the body, though chị Hiếu gets help to attach her wheelchair to the back with octopus straps. The foot-pedal gear shift is replaced by a long lever, clutching being taken care of by the centrifugal contraption standard on these sorts of bikes, and the foot brake is moved to the left hand grip. Many have a reverse gear added. The modification costs four million VND ($AU250). I ask chị Hiếu about her driving experiences, and she is quick to tell me that the impact has been huge: ultimately it gained her employment and a husband, and I can say that her year-old daughter has an unearthly beauty. She is thankful to em Loan for pressing her to try a friend's xe ba bánh, and encouraging her to be independent. I ask if other road users show her any particular courtesy, and she demurs: she is treated the same as everyone else. She is yet to tangle with the police, as is em Bích. Three-wheel "all terrain vehicles" have been banned in the West for a long time due to their appalling safety record, and I have no doubt that these machines are even more dangerous: the rear track is narrow, and cornering requires significantly more care than on a two-wheeler as the centre of gravity is quite high. Nevertheless em Bích assures me that learning to ride a xe ba bánh is easy, provided you have no two-wheel habits to unlearn. Heavy vehicles have been regulated for a long time now, see Andrew X. Pham's Catfish and Mandala. Em Loan fills in the pre-history: before about 2007 the State was not too concerned with the formulation or enforcement of the laws regarding self-modified vehicles. This changed when motorised traffic started choking the streets of the major cities: claiming that xe ba bánh took up more than their fair share of road space and inflicted disproportionate damage on other road users in accidents, the State decreed that there would be no more of these vehicles on the road by the end of 2007. I am confused, for the vehicles of PWDs look quite innocuous and not too numerous, as do the marvellous xe lôi of Châu Đốc. Em Loan corrects me: the ban is targeted at those used for carting goods around. These machines look like a chainsaw attached to half of a car chassis, and for mine are the scariest things on the road. The rider sits low behind a sizeable tray, usually carrying such a ridiculous amount of stuff that he is barely visible from the front. Steering is cyclo-like: the poor labourer has to pivot the entire tray, which is mounted on two wheels, while sitting above a farting two-stroke that is supported by a single wheel. There is no safety gear at all; no chain guard, no bumper bars, no rags on the loads that sometimes extend two metres fore and aft. It is unusual to see one with registration plates. I am in hearty agreement with the State that these lethal things must be killed. Vietnam has many ethnic minorities who live in inaccessibly remote locations and lack education. Their situation parallels that of Indigenous Australians. In this case the big stick of State proved ineffective. Why, I ask em Loan: all such vehicles are bleedingly obvious in traffic, and the Australian in me expected the police to latch onto this revenue stream with all twenty digits. She tells me that the cops on the streets of Vietnamese cities know how tough many people do it; the disability rate here is almost certainly in excess of the worldwide typical 10%, and while the State has been amazingly successful at reducing poverty, the remainder of the task is Herculean. No xe ba bánh driver is well-off, and the pointy end of the law does not want to alienate the community, just milk the sufficiently affluent for karaoke money. I heard about this from em Bích and em Loan in May 2010. Em Loan aided in the rescue of a foreigner's rented motorbike from the clutches of local law enforcement. Em was vague on the details; perhaps the fine was 200,000 VND, and the vehicle was impounded for a month. Of course the most conspicuously affluent people are the Westerners, and as the police mostly turn a blind eye to the vast majority who drive without a licence, their enforcement of the State's crackdown in 2009 came as a shock to many expats: for once the marginal extra revenue and pressure from above must have outweighed the hassles of the paperwork, the culture barrier and having to impound the riders' machines, though I grant that the opportunity for some grease may have helped tip the scales. Just how did the State get the law enforced in this instance? I hazard a guess that the status quo notoriety of allowing tourists a lot of freedom dominates any substantive safety concerns, increasing the mystery. Pranab Bardhan's Corruption and Development: A Review of Issues (September 1997, Journal of Economic Literature 35(3) pp1320-1346) provides a good overview of corruption in the context of development. He quotes Samuel P. Huntington: "In terms of economic growth, the only thing worse than a society with a rigid, over-centralized dishonest bureaucracy is one with a rigid, over-centralized, honest bureaucracy." This relative flakiness of formal, Enlightenment-style institutions in the developing world is a source of great alarm to the average Westerner who is so accustomed to the safety of anonymous interactions with rule-governed systems. No-one really wants to haggle over a visa fee, do they? How about bargaining with a traffic cop over running a red light? As institutions mature, their operational policies become more codified, curtailing the discretion of the flak catchers, which is problematic in the absence of functional law reform. There are fine lines between discretion and corruption, of course, but in failing to enforce the xe ba bánh ban the cops are certainly doing the right thing; perhaps it is the best response to a State which has a strong grip on reality but a much weaker one on evidence and persuasion. Elizabeth Pisani in The Wisdom of Whores (W. W. Norton & Company, 2008) observes that the more authoritarian states (China, Thailand, Vietnam) have often been more willing to support harm-reduction measures that reduce the spread of HIV than more democratic ones (the U.S.): the stick can be quite effective. The State, long acculturated to coercion by the struggle for post-colonialism, sometimes tries to induce behaviour through incentives, though mostly only after the stick fails. (You could argue that the West has the reverse problem of finding the stick, as evidenced in the fallout from the ongoing global financial crisis.) Thus the successive attempts since 2007 to get rid of the cartage vehicles have featured increasing payouts to encourage drivers to either buy much safer small light trucks or get educated. The five million VND (circa $AU300) now on offer has failed to persuade many of them to change livelihoods, and the district-level implementation has been a recipe for patchwork and graft. The weakness of a multi-tiered bureaucracy is well known, and there is a similar problem with the State's well-intentioned employment law that requires all workforces to include a cohort of at least 2-3% with disabilities. Em Cử told me that between the difficulty of finding suitable PWDs and the paucity of the punitive tax for failing to meet this statute, most organisations unreflectively pay up. These funds are supposed to finance locally-organised vocational training, which has apparently not been set up in Thành phố Hồ Chí Minh; or perhaps it has been, but disbursement procedures have not — at some point it becomes too difficult for me to discern just what the blockage is. So how is the State influenced by those it regulates? This Westerner naively proposes some courses of action: court cases, direct submissions, committee memberships, cooperation with other organisations; in essence, what has done the trick for PWDs at home. Political expression is perilous if the State takes sufficient umbrage, and it is unfortunate that disability issues are still considered political, but then, most collective behaviour is. However there are some sections of the community that do have enough prestige to directly challenge the State; for instance, people representing the legacy of the ten-thousand day war, particularly PWDs in Hà Nội, are difficult to suppress. This militaristic romanticism is unavailable in Thành phố Hồ Chí Minh, which sometimes seems like Pluto, having a variable classification, its own satellites, a chaotic and highly inclined orbit, but nevertheless going about its business. Thus em Loan prefers to raise awareness via newspapers and television, as many reporters are sympathetic to disability-related issues, continually on the lookout for the safely subversive. DRD itself has been more directly involved in discussions with the State, influencing the development of laws applying to PWDs throughout the country. At a meeting to discuss the issue of xe ba bánh registration with DYA members on August 4, 2007, the local transport department suggested something less than pragmatic: in concert with the manufacturer Phana and the polytechnic university, a xe ba bánh would be designed and fabricated that could be registered. The blueprint I saw was for something similar to the Piaggo MP3, which is much safer than the current ones. However as always the economics was ignored: a new motorbike of any kind is beyond the means of most PWDs, who felt it to be more of an engineers' dream than what they needed. As far as I know the design never got off the table. Fortunately em Loan was persistent in her persuasion of Handicap International's contact in the provincial transport department, and after several months, on March 15, 2008, DYA held a registration day in the forecourt of the HCM Communist Youth Union building. Officials from the department came to examine the vehicles, doing little more than measuring the track and wheel base, ensuring the bike had at least one mirror, taking a photograph and filling out some paperwork. About 110 vehicles where processed, with feelings of progress, recognition and good will. Smiles all round, and moreover it established a registration protocol for other localities to adapt. Thus the riders find themselves in the peculiar situation of being flagrantly illegal drivers of legal vehicles, which remains the case to this day. As George Orwell might have observed, the prevailing attitude seems to be "two wheels good, three wheels bad", though it is definitely becoming "two wheels good, four wheels better" as the affluent pull ahead. If the State was serious about improving the traffic it would more severely restrict the other kinds of vehicles that so obviously hog the road, but of course this is politically impossible. We launched the website by inviting some journalists to a show-and-tell at the Open University. It turned out that a minor feature I implemented on a whim, a zoom layout, was the major novelty, with some claiming that DRD's was the first website in Vietnam to have it. Though it lay beyond my capacity and the regulations of the program, I wish we could have advocated for the accessibility of State information at the local and national levels. 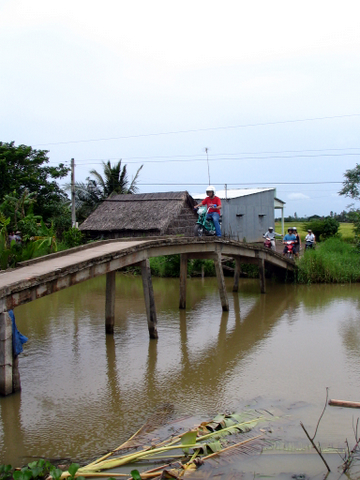 Chị Mai's bicycle rides voi Úc. I returned to Sài Gòn in May 2010 to find that while the immigration officials are as banally offensive as always, there are no longer armed men on show in Tân Sơn Nhất Airport — one must now go to the American, French or Korean consulates, or the local People's Committee, to see bored kids with weapons in public. The old DRD building has been razed, to be replaced with a five-story edifice that will dominate the area. There is a schedule of safety regulations and fines attached to the front fence, and this reassuring sign of progress now seems common to many large building sites. This time I ride a bicycle, and find I get more respect from other road users than on the motorbike; taxis give me space, I cruise around with fewer discontinuities than usual. Is it the novelty of a large foreign bloke on a push bike? Perhaps it is familiar from childhood that momentum is precious. In any case I sweat profusely and shamelessly. Regulations are being enforced: Construction violations decline in HCM City, Vietnam News 2010-05-22. Unfortunately it seems that PWDs can no longer register their xe ba bánh. I am saddened that things haven't stuck, that progress is not monotonic even for small things like this. Trading the patriarchy of big brains for the matriarchy of good intentions and rubbery thinking for a year made me realise that I am highly unlikely to find a socially beneficial vocation where I could really use my skills; my peers (and now I) have shifted into commerce, finance, system administration, manufacturing arbitrage, the unreality of urban planning. The AYAD experience remains too raw, and now too distant, to come to terms with. The author was funded by AusAID for the year July 2007 — July 2008 under the Australian Youth Ambassadors for Development program to develop a website for DRD in Thành phố Hồ Chí Minh, Việt Nam. I wish to thank everyone named in this article, those I have discussed it with, and in particular Tim Bourke, Peodair Leihy, Peter Rickwood, Nell Robertson, Andrew Taylor and Mark Wotton for their encouraging comments.